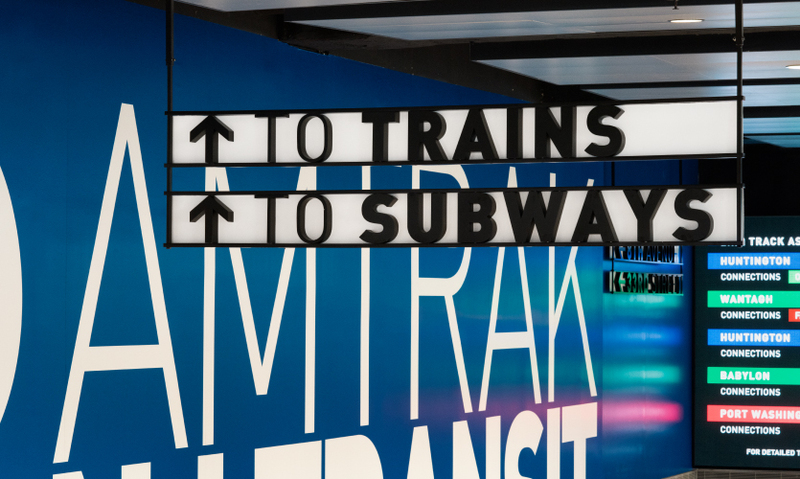 Penn Station currently serves more than 650,000 passengers a day, and navigation through the hub's network of subterranean halls and tunnels can be challenging for commuters. Bold, friendly and engaging, the system emblazons the station with helpful supergraphics to guide travelers. 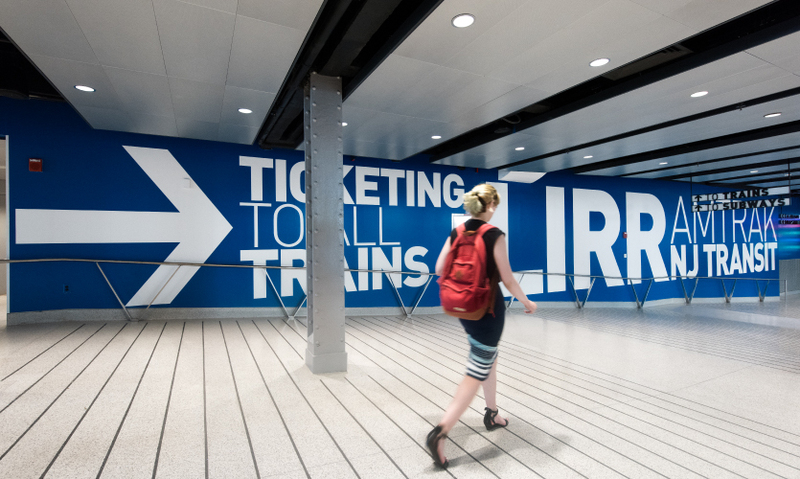 For greater visibility and pedestrian flow, the supergraphics are applied directly to the walls and columns of the concourse. The typography is set in highly legible sans serif DIN, which was originally designed in the 1900s for road and railway signage. 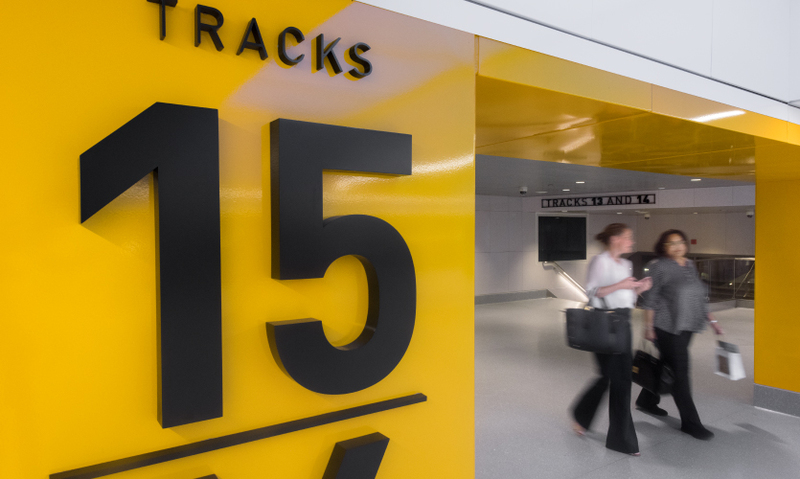 The program ranges from mural-like installations that cover 100-foot-long walls directing commuters into the concourse to 3-foot-high numbers identifying the individual tracks. The color palette of bright blue and yellow make the interiors feel more cheerful and evokes the skylight that will be installed in the coming Train Hall. As the project progressed, the contractor coordinated with designers on a regular basis to efficiently execute the custom interior and exterior aluminum signage. 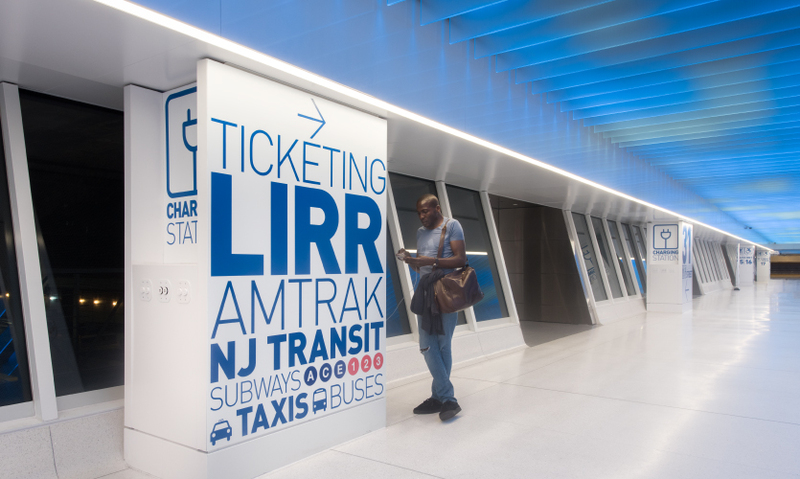 The project uses messaging in a welcoming, engaging and, appropriate for New York, in-your-face way to guide passengers through the environment. LED cloudscapes on the ceiling lift the mood and hint at the forthcoming renovations. The phase-two opening of the state-of-the-art Moynihan Train Hall in the Farley Building will signal a return to grand, sky-lit, above-ground open spaces for the transit hub, while significantly increasing the rail system's capacity. In 2017, the busiest transportation hub in the Western Hemisphere, Penn Station in New York, revealed its new West End Concourse—the first phase of the Moynihan Station redevelopment anticipated to be complete in 2020. 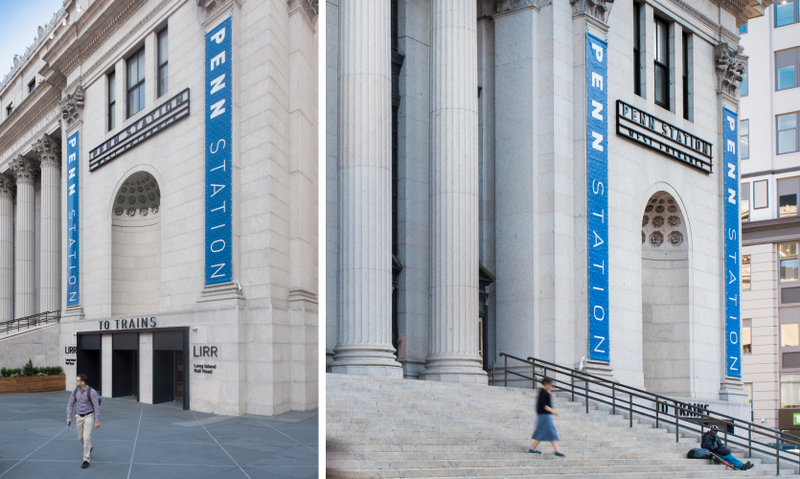 The new concourse provides open access to 17 of Penn Station’s 21 platforms through the James A. Farley Post Office Building on Eighth Avenue across the street. Penn Station’s history is the source of much regret for New Yorkers; the original Beaux-Arts style structure was razed to make way for the Madison Square Garden Center complex, which led to the demolition being famously referred to as a “monumental act of vandalism” by the New York Times. In 1968, the station became a completely underground structure and, subsequently, has come to symbolize a loss of majesty in public spaces like rail stations. The phase two opening of the state-of-the-art Moynihan Train Hall in the Farley Building will signal a return to grand, sky-lit, above-ground open spaces for the transit hub, while significantly increasing the rail system’s capacity. Construction on the West End Concourse began in 2012 with the goal of providing expanded service to Amtrak and Long Island Rail Road passengers. 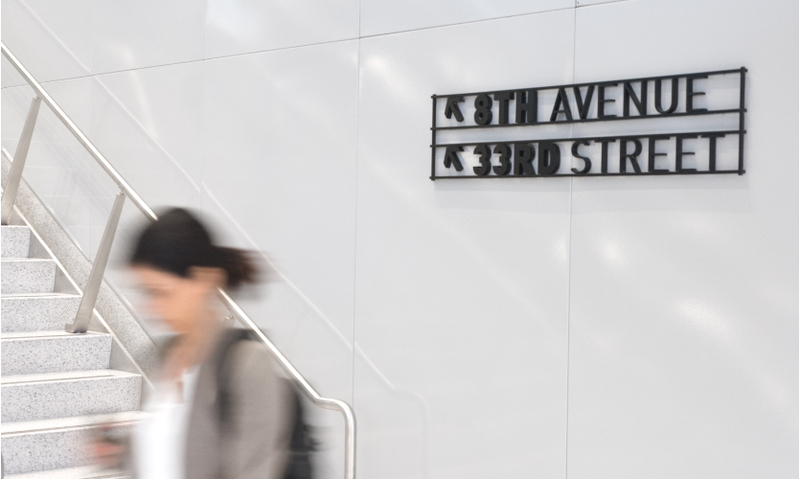 Five years and $315 million later, a nearly 37,000-square-foot area is festooned with a big, bold supergraphic wayfinding system designed by Michael Gericke’s team at Pentagram in close consultation with architects Skidmore Owings and Merrill (SOM) LLP. More importantly, though, the concourse presents a bright new way forward from the crowded, confusing subterranean labyrinth that more than 650,000 daily commuters had come to know. 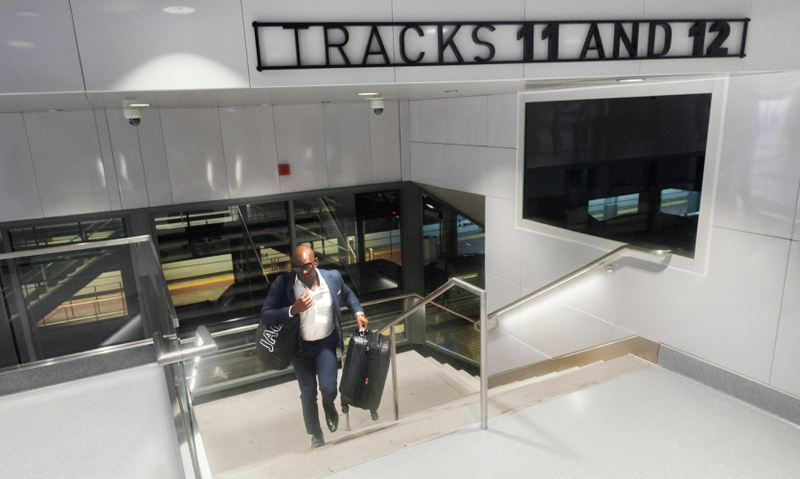 On opening day, customers were enthusiastic about the changes—snapping and sharing photos—and one even lamented to the Wall Street Journal that the new wayfinding applied only to a small portion of the station. 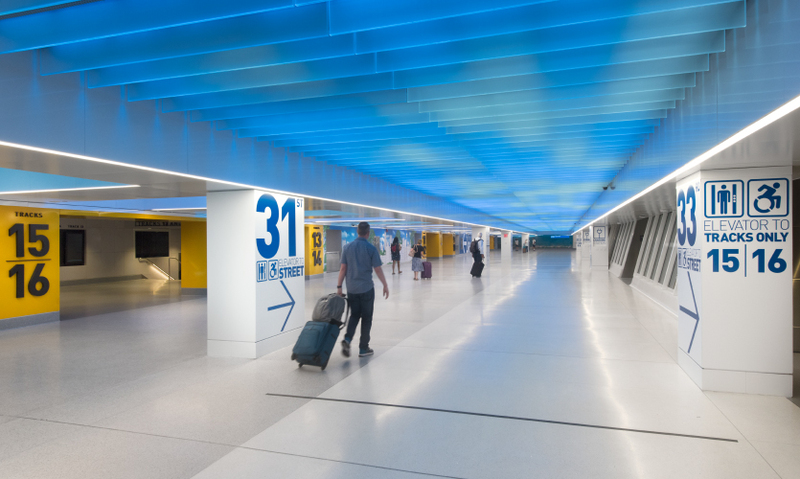 Through a thorough design research process that included extensive modeling and a review of travelers’ paths of travel, the Pentagram team reached the larger-than-life concept for the concourse. “People have been trained to follow a sign to a sign to a sign,” associate partner Don Bilodeau told Fast Company. “We thought, you can make one wall a sign instead of making five signs. 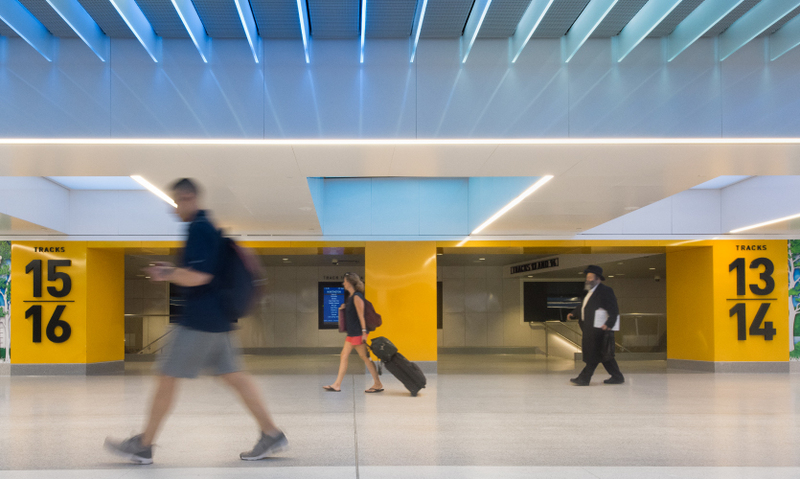 It engages the users and makes the space friendlier and not as dark and dank and miserable.” Gericke, partner and project lead, asserts that starting with better circulation and wayfinding was an important step to improve the commuter experience at Penn Station. 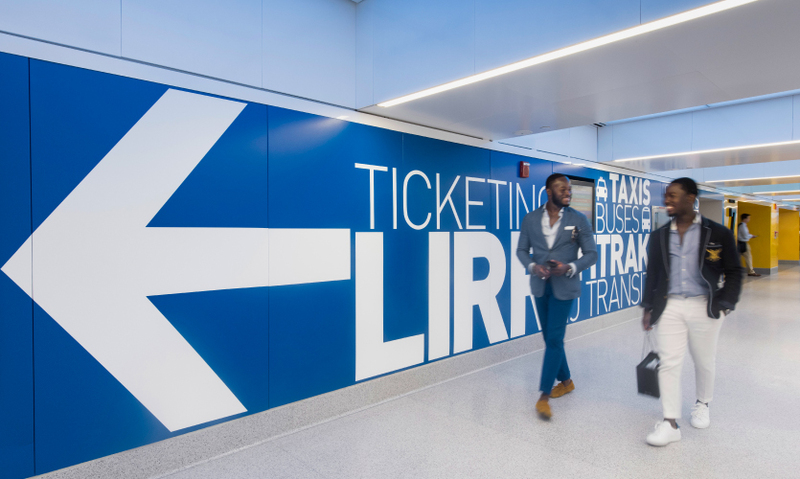 “[It’s meant to be] a simple, effortless, friendly and engaging experience that makes you feel good about arriving at or leaving from Penn Station. We didn’t want to be shy about wayfinding. It's something that reaches out from a distance,” explains Gericke. “It’s an intentional attitude that rather than turning our backs on passengers, we’re going to get you there as fast as possible.” The straightforward integrated nature of the supergraphics is indeed highly visible, preventing slowing of pedestrian traffic. The treatment is not only effective; it’s decidedly cheerful too. 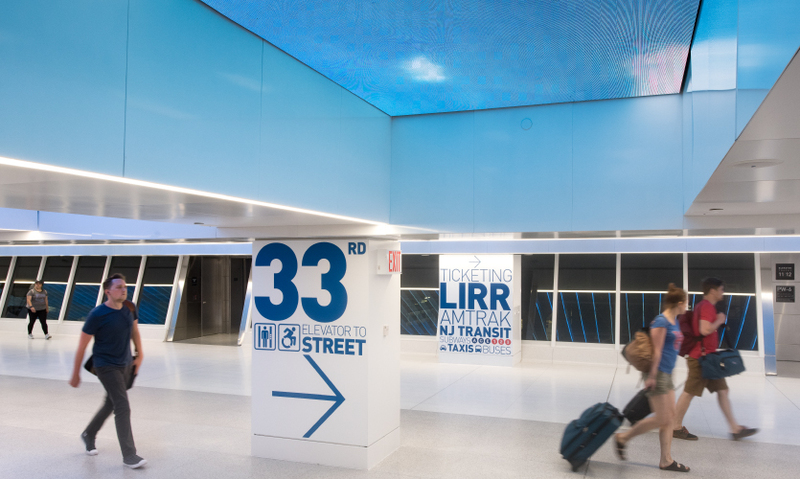 Passengers are greeted by brightly-lit white, blue and yellow supergraphic wayfinding messages (a nod to the skylights to come) in conjunction with more traditional aluminum dimensional lettering signage. The design team chose the sans serif DIN typeface family specifically for its legibility and its legacy: It was developed for use on railway signage in the 1900s. The supergraphics, totaling nearly 50, stretch to 100 feet long and 10 to 14 feet high and are applied directly to the walls and columns. Overhead, an animated canopy of happy LED clouds waft by, a part of the project that was initiated by the design team and developed by SOM. While the new wayfinding is only in a portion of the station at the moment, it is a big, bold expression of both the aspirations of the forthcoming renovations and of the Pentagram team to create “effective civic wayfinding and environmental graphics that are unexpected and lasting.” Fittingly, in the time since the concourse opened, the supergraphics have not been tampered with or vandalized—a testament to their usefulness, visual appeal and the palpable appreciation of travelers.